The information about this bug in Launchpad is automatically pulled daily from the remote bug. This information was last pulled on 2018-06-23. In the latest gnome-media (2.25.5-0ubuntu1) in Jaunty, gnome-sound-preferences has been merged into gnome-volume-manager. But gnome-volume-manager is missing the adjustments for system events that were in gnome-sound-preferences. See attached screenshots - the one from Intrepid has 'Alerts and Sounds' and allows the user to edit the sound files for various sounds (and to test play the sounds). The one from Jaunty only lets you select an alert sound (which doesn't seem to work, incidentally). We're currently using the same capplet than in intrepid so this shouldn't be an issue for Jaunty, but keeping the bug open to track it for jaunty+1, thanks. 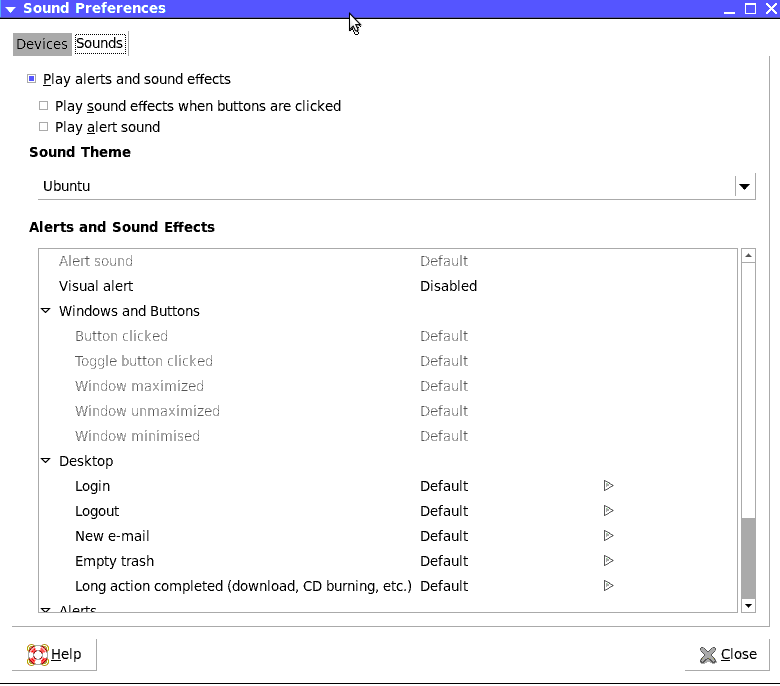 See the screenshots in the original report: gnome-sound-preferences has an 'Alerts and Sound Effects' list that lets you change the sounds for button clicks, login, logout, etc. 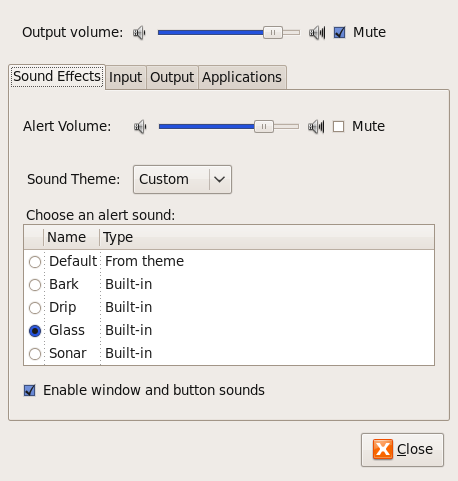 gnome-volume-control in Jaunty has a 'Sound Theme' tab with only 'Choose an alert sound' and 'Choose a sound theme' selections. So g-v-c is missing the 'Sound Effects' part. jaunty uses what you call the intrepid dialog no? Yes, I think it does. The problem is that Gnome 2.26 removed gnome-sound-preferences, but didn't move the 'Sound Effects' tab across to g-v-c, so they were missing. I opened this bug because of that. Then Ubuntu brought Intrepid's gnome-sound-preferences back into Jaunty, so this bug isn't relevant for Jaunty now, but it's being kept open to track for karmic (see comment #3). Added tag regression-potential for Karmic as the old capplet is now gone and the removed functionality has not been preserved in the new volume control. It is definitely a problem in Karmic, so it is a regression. Yes indeed, I have been tearing my hair lately to try to find a solution to this. I normally disable login/out sounds and keep the rest of the system sounds. Now this is seemingly impossible in Karmic. Please, do something about this regression! Note that system -> preferences -> startup applications allows you to turn off "GNOME Login Sound", which I'm assuming covers the "disable login/out sounds and keep the rest of the system sounds" case (but does not let you do everything the old preferences panel did). Which has IMHO wrongly been sidelined as "Wishlist". This bug has now gone live 9.10. Users are now unable to change sounds through some GUI. I suggest changing the priority of this bug to something high. It's a real bad regresssion, that removes existing functionality. Not nice when upgrading. Is it possible to install the old gnome-sound-preferences? The current functionality is sorely lacking, users can only chose a theme or disable sounds completely but don't have any control over individual sound alerts. The only partial solution for this so far is this one (http://www.rebelzero.com/tweaking/hacking-sound-themes-in-karmic/209) but anyway this is a damn f*** regression... God bless KDE. It is quite embarrassing to recommend Ubuntu to family, friends & neighbors and then have them ask you why they can not assign sounds to various system events like they could in M/S windows and then have to tell them that you are sorry but you can no longer do that in the latest versions of Ubuntu. Yes, you could under the older versions but not under the newer versions. And then you have to watch them figuratively scratch their heads and say well that really does not make any sense, why would it work under older versions and not under the newer versions and then you have to agree with them and wonder along with them if perhaps whoever is maintaining this software may not know what they are doing !!! And if something as basic as this does not function, then what'all else is there that may not work like it is supposed to !!! 1) Ubuntu users need to be able to customize **alert sounds** (in any readable directory for that user). 2) A utility should be made available for users with little knowledge of the spec to create custom **sound themes**. A few ideas on how to resolve this. The second part (sound theme creation) is a mess and I'm not sure how to go about making it easier to use. We can't/shouldn't be able to customize all event sounds (Enable window and button sounds) within Sound Preferences. There are over 100 sound events available (see "Sound Naming Specification"). Allowing users to change them all inside Sound Preferences utility would be not be neat. However, importing a sound theme from any accessible location should be clean enough. The issue still remains: How doe the average use create a sound theme? It could be solved by creating a utility to simplify the process of creating sound themes. I suggest a utility be created for this process. This utility would bring up a list of all 100+ possible events and then allow the user to assign sound files to each. It will then output a folder containing a index.theme file and a stereo folder with all the sounds (converted to .oga format if needed). Hi. Is someone working on this bug? If not, is there someone here who is in a position to accept a patch? Well, I ran into this on my Fedora install....and of course my Lucid install suffers from the same fault. Sound themes are great, but only if you can build them easily. I'm glad to see that others share my opinion. Komputes is right on the money...the only thing I would add to his first suggestion is that a ~/.sound_themes type directory would be nice as well, so a user could install a sound theme without root privs. Unfortunately, there is no .DEB yet, so if you want it, you'll have to build it from source. If someone who is more knowledgeable about creating deb packages wants to give it it a go to help out the non-programmers, just let me know. Be sure to read the README, BUGS, and TODO files to be aware of current issues, and if you find a bug not mentioned in the BUGS file, please drop me line. Anyway, I hope that helps somebody out...I'm off to edit my 'Trek' theme.....enjoy! what are you doing Ubuntu!